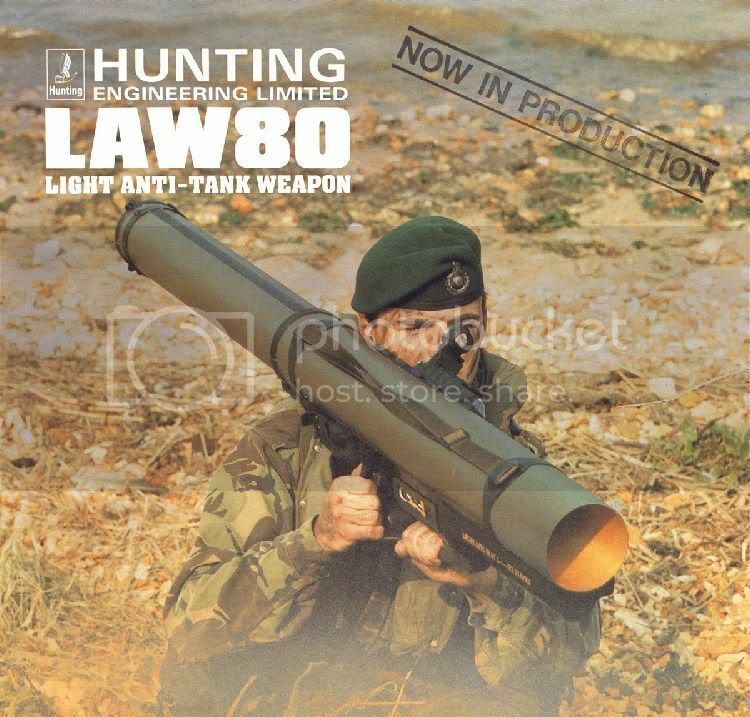 The LAW 80 (Light Anti-armour Weapon 80), sometimes erroneously referred to as LAW 94, is a man-portable, disposable anti-tank weapon currently in use by the British Army and a few other militaries. The weapon consists of an extendable launch tube with an integrated 9mm spotting rifle and 1× sight. The spotting rifle has five rounds of ammunition, and is ballistically matched to the rocket. 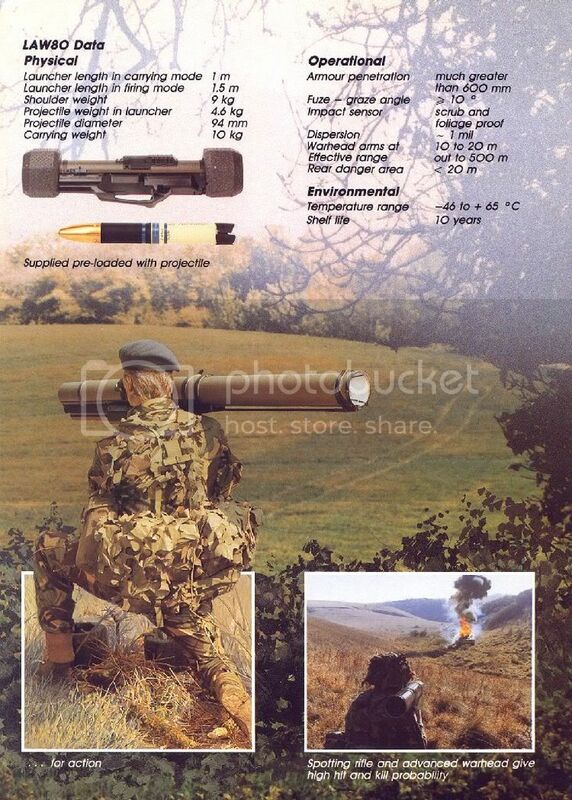 The rounds it uses are quite unusual, consisting of a 9 mm tracer bullet loaded in a necked up 7.62mm NATO shell casing, with a .22 Hornet blank mounted in the base of the larger case, providing the propellant charge. Upon firing, the .22 cartridge case pushes out of the back of the 7.62 mm casing, unlocking the breech of the spotting rifle in a form of primer actuation. The spotting rifle on the USMC Mk.153 Mod.0 SMAW was derived from the LAW 80. To launch the rocket the firer removes the large protective end caps and extends the rear of the launch tube, opens the sight, and moves the arming lever to "armed". The weapon is then in spotting rifle mode. To fire the rocket, the firer moves a charge lever forward with his firing hand thumb. The rocket motor burns out before it leaves the launch tube, the resulting blast being directed rearwards from the launch tube. The rocket then coasts to the target, arming itself after it has passed a certain arming distance. 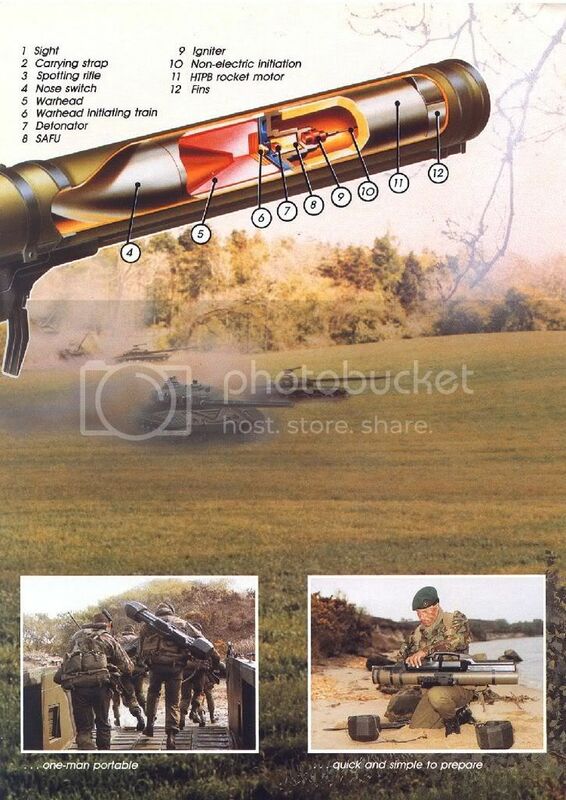 The warhead is a HEAT shaped charge and could penetrate 700mm of Rolled Homogeneous Armour at 90 degrees, as was taught to soldiers trained on the weapon system in the British Army, Royal Navy (Royal Marines) and RAF Regiment. It was also taught that sloped, composite and ERA, would reduce the penetration and would be an important factor when selecting the aiming point. 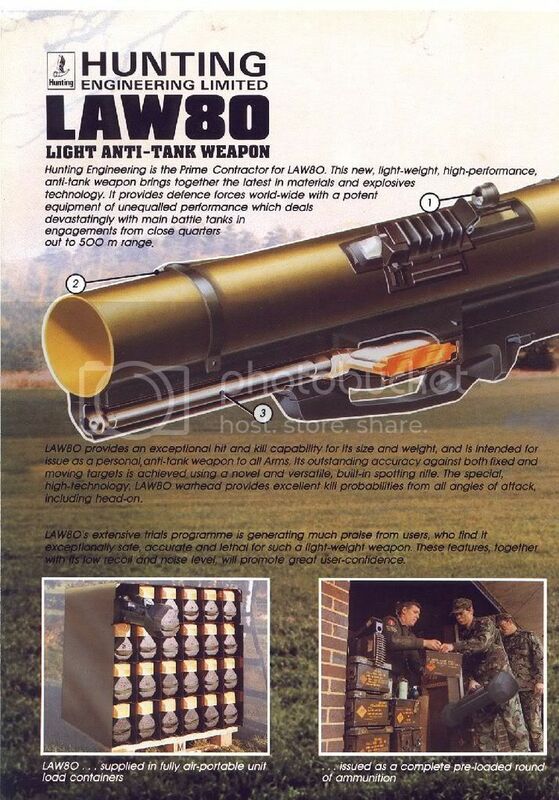 United Kingdom: Initially adopted in the early 1990s, replacing the L14A1 84 mm Carl Gustav recoilless rifle and M72 Light Anti-Tank Weapon (Rocket 66mm HEAT L1A1), it was withdrawn on safety grounds in favour of the AT-4 CS and eventually the NLAW. Addermine is an acoustic sensor system which utilises the LAW 80 as a kill mechanism to create an off-route mine. It can also be command detonated from up to 200 m away. ^ "Cartridge of the Month". cartridgecollectors.org. ^ Owen, William F. (2007). "Light Anti-Armour Weapons: Anti-Everything?" (PDF). Asian Military Review. Archived from the original (PDF) on 2011-07-07. Retrieved 2010-05-12. This page was last edited on 10 November 2018, at 19:42 (UTC).